Summertime is the season for family reunions, picnics and other celebratory get togethers. Many of these events centre around the food that is served and shared together. Whether it's your aunt's yummy potato salad, grandma's special apple pie or dad's famous BBQ ribs, we all have favorites that we look forward to eating, almost as much as we look forward to seeing our family members! CM Designer Melissa Ullman says..."Food is a common denominator among people when they get together. It does more than just feed us. It connects us to our roots and those we love. Create this great collection of favorites for yourself, or ask everyone at your next reunion to contribute their favorite recipe for an album." Whether you want to create a collection just for yourself or to make several copies to share with extended family members, you'll make quick work of it thanks to the easy-to-follow instructions and layout suggestions that you can download here. You can purchase and use the amazing Nancy O'Dell Recipe 8x8 Quick Album for this project, or use supplies you have in your stash. 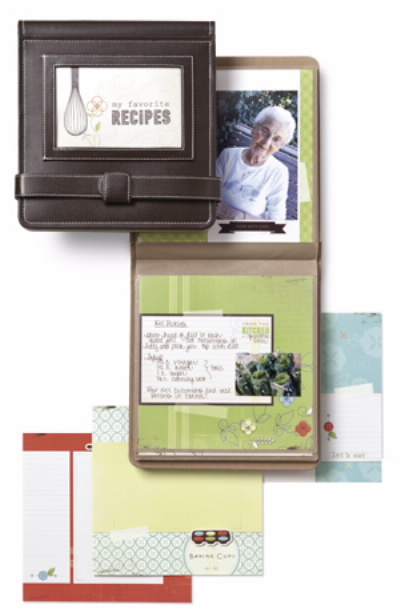 The kit includes an all-in-one, pocket-style photo album, predecorated pages, stickers and accents that turn your recipes and photos into an instant treasure. The strap also converts the album into an easel for easy countertop display. At the event, make sure to snap a photo of all the dishes. Even better, get a photo of the cook holding the dish! After the event, add the recipes and photos onto the pre-decorated album pages. Embellish with a few stickers from the kit - letting the photos and recipes be the stars - and slip the pages into the album. If you prefer to tacklet this project on your computer, the Nancy O'Dell digital recipe kit features the same artwork. This option is great if you want to make many copies of the book to give to family members...simply make one book, upload it to the digital centre and print as many as you need. A bonus...the digital artwork and 8x8 hardcover storybooks are on sale until July 25th! Whichever option you choose - traditional or digital - you will end up with a family recipe collection to reasure for years to come!